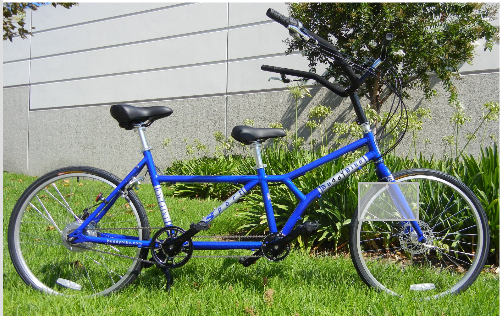 The electric buddy bike adds power assist to the popular parent/child buddy bike. The design allows the the parent to have complete control with the child right in front safely between your arms. No need to keep turning around to keep an eye on your child. The child also feels much safer so both of you can relax and enjoy your ride. If the child should have a problem you are immediately aware and can react accordingly. You steer together and pedal together and yet you have complete control. Children can easily hold onto the handlebars and stay seated and balanced. With the 500 watt motor you can pedal for some great exercise or often just relax and cruise at up to 20 MPH. The solid rubber tires mean you never have to change a tire or check your air pressure. The thumb throttle functions just like a gas pedal so the harder you push the faster you go. Seats and handlebars are adjustable to accommodate any size riders and for the child who cannot quite reach the pedals there are optional fold out foot pegs which attach to the frame. Reaches speeds of up to 20 mph - Enjoy the speed and torque of a 500W motor. Simple thumb Throttle - Easily clip the throttle onto your handlebar and have power on demand. Flat-proof solid foam tire - You never have to worry about getting a flat or even checking tire pressure. Quality Constriction - Made in the USA from US and Imported Parts.